In the second of a series of infographics, Vita has released a free, downloadable Varroa Infographic. New research has revealed the different gene mutations that have enabled varroa mites to become resistant to acaricides and helped explain Vita’s earlier observations. Vita’s 2015 international photo competition results are in and the 2016 Calendar is ready. The Pinnacle Winner of the first Vita Honeybee Health Initiative Award is a research project run by the UK Devon Apicultural Research Group potentially involving hundreds of beekeepers as well as professional scientists investigating honeybee queen fertility. Seven Distinction Winners have also been announced with a wide range of projects including group bee disease identification, a children’s project and a bee wellness programme. At Apimondia 2015 in Daejeon, South Korea, two companies based in different hemispheres and with the common aim of promoting honeybee health have announced that they are joining forces to offer beekeepers a wider range of bee health treatments, feeds and products. 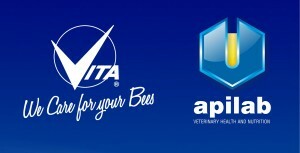 Vita (Europe) Ltd, the world’s largest dedicated honeybee health company, is teaming up with Apilab, veterinary beekeeping product manufacturer active across South and Central America. Through joint marketing each company’s products can be made more widely available and there are possibilities for joint research and development activities. The process to gain pan-European regulatory approval for Varroa control products and honeybee treatments such as HopGuard is not easy. Yesterday the regulatory team at Vita met to discuss the next stages — residue assessment. My Beekeeping Year is a fun, A4-sized seasonal chart for beekeepers to note down memorable events during their beekeeping year. Download it for free.